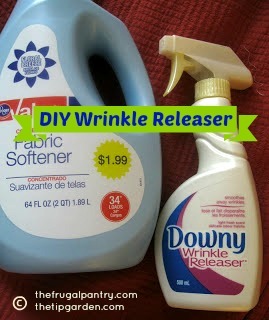 Making your own wrinkle release spray is only pennies to make! If your a family on the go like mine is, finding short cuts to getting ready for the day is crucial. I love the commercial bottle of wrinkle release spray that I'd been using, but didn't want to pay the price for a new bottle all the time. I went on a search for making my own, and share my experiment and final product with you. You will only need to buy a bottle of fabric softener. Find a scent you like. I just went with the cheapest store brand I could find for $1.99. It'll last me forever if I only use it to make wrinkle spray. After searching and trying different ratio's of fabric softener to water, the one I liked best was the 1 to 10 ratio. One part softener to 10 parts water. 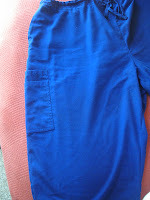 Pour one capful of fabric softener into your spray bottle and then add 10 capfuls of water. Gently shake to mix. What I actually did was: Pour in one capful of fabric softener into the spray bottle and then fill the 500 ml bottle (the one the original wrinkle spray was purchased in). with water, so slightly less than 10 capfuls. 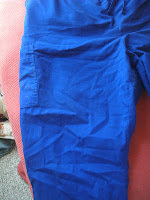 I sprayed the pants with the wrinkle spray, smoothed the fabric with my hands, and here's the picture 2 minutes after I sprayed it. So not completely wrinkle free, but hey, that's what an iron is for right? It's certainly much better, and as I look at the pants even now, about 10 minutes out, they are even better than the picture above. My conclusion: Making your own wrinkle spray is worth the savings. It does a good enough job to help out in a rush. Let me know what you think!